Thermal blend time: You can measure thermal blend time by deploying temperature probes inside a tank and measuring the time it takes for the volume to go from initially stratified to thermal homogeneous (same temperature throughout). Chemical blend time: Another, more demanding, test of mixer performance is the measurement of chemical blend time. A dose of (chlorine) disinfectant is introduced into an isolated tank and allowed to settle on the floor. The mixer is then turned on and water samples are taken from various depths and locations in the tank. While this involves multiple manual samples, the results can clearly resolve whether a specific mixer is sufficiently powerful for controlled chemical dosing. Even when a tank is thermally homogenous, it may still be chemically stratified. Whether measuring thermal blend time or chemical blend time, a mixing system must be able to achieve a fully blended condition in less than the cycle time of the tank. 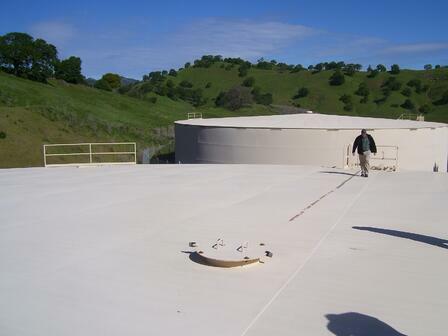 Most water storage tanks have a fill/drain cycle that is 24 hours long. Thus, many mixing systems are specified to achieve fully-blended conditions in less than 24 hours. However, if a tank is cycled at a higher frequency, the required minimum blend time will be shorter, and the demand for greater mixing power will be higher.